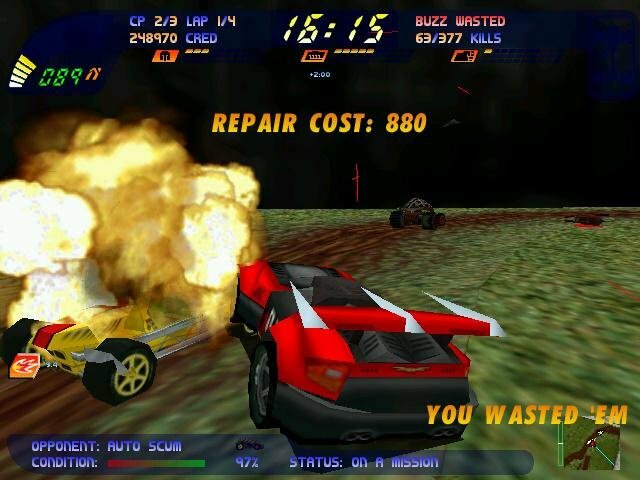 Plenty of comical violence makes this no-nonsense destruction racer a joy to play. 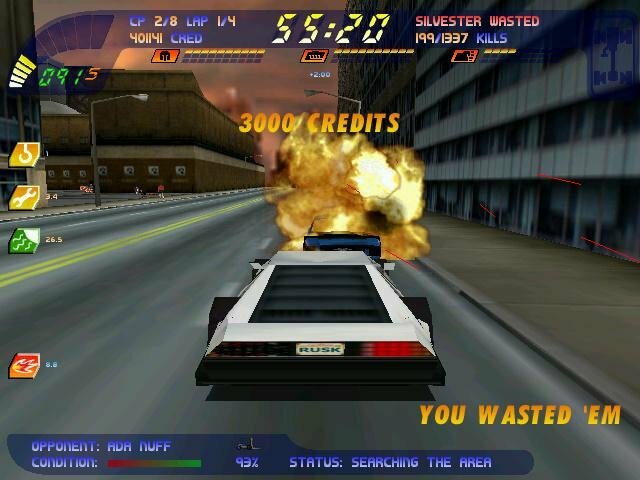 You’re placed in a densely populated urban environment with a score of five or more deranged racers with the sole purpose of inflicting bloody terror upon the terrified populace and possibly each other. Pretty cool concept, right? 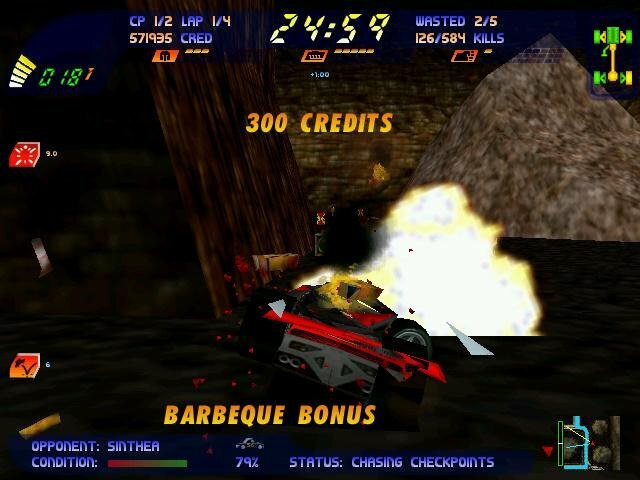 Unlike other racing games, Carmageddon 2 comes with no rules attached, and indeed doesn’t even include much racing. 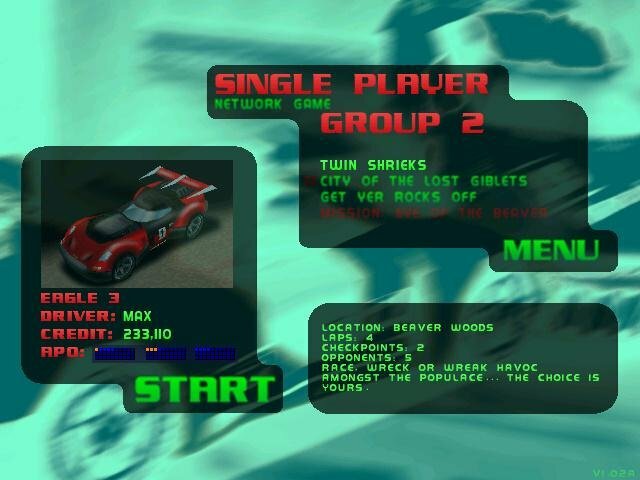 You win by either killing all of your fellow drivers, racing through the checkpoints or exterminating every innocent pedestrian on the map. 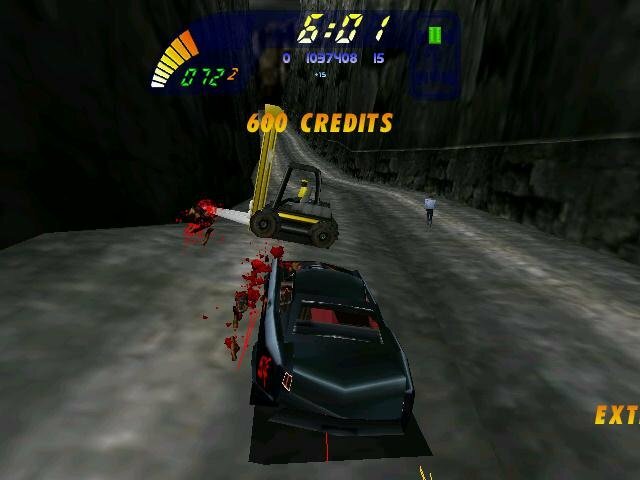 The things that made the original Carmageddon such a wonderful game are still present. 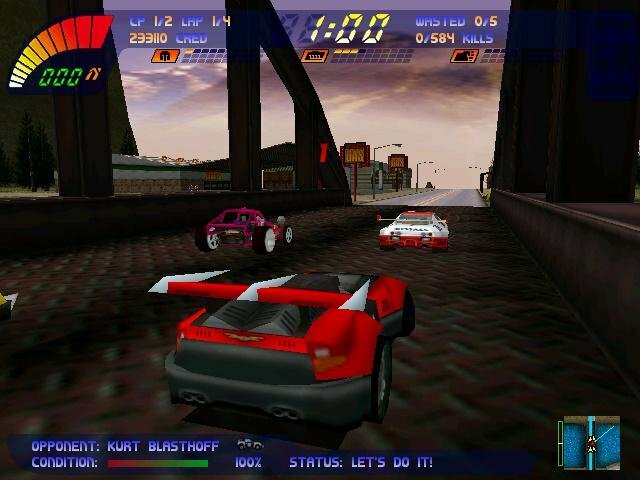 Few games not called Grand Prix Legends better represent the dynamics of a vehicle—the weight transfer, the understeer, the oversteer, the (exaggerated) physics of driving—than this game. 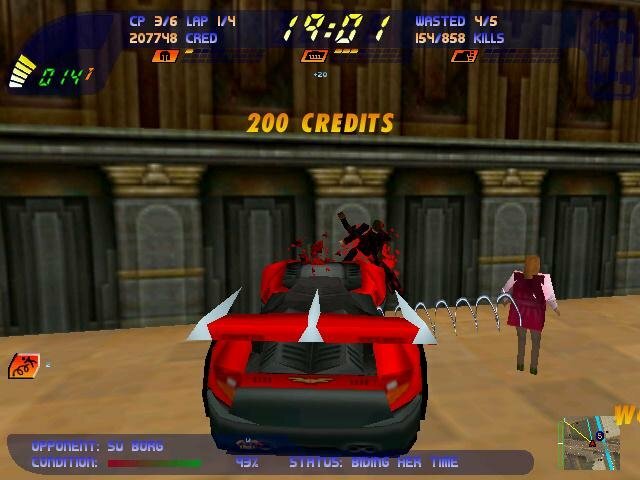 The collision detection is phenomenal—the body panels that rip off your car can actually damage innocent pedestrians. 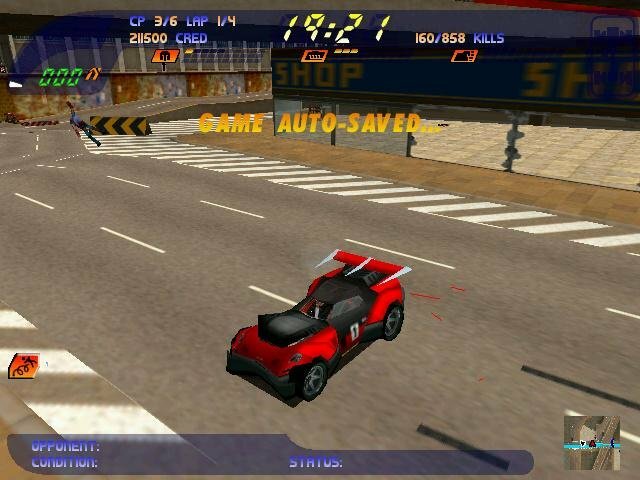 Racing on an airport, you’re able to drive under a 747 as its taxiing on the runway (you can also try to ram it which, assuming you survive, causes it to crash). 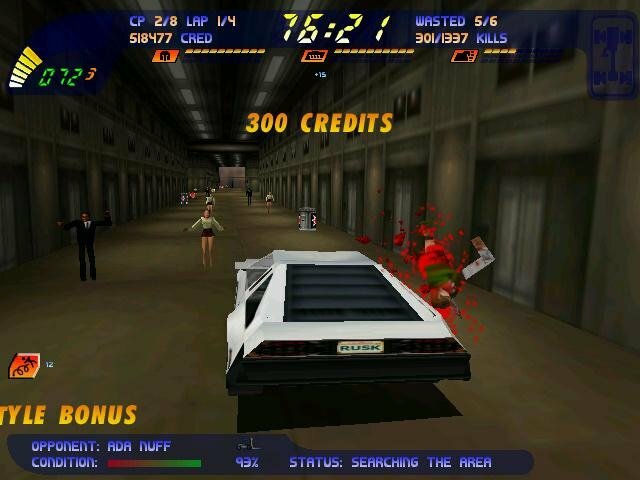 The environments remain enormous, with some truly inspired locations (an aircraft carrier called the USS Lewinsky, an airport, an amusement park, a ski resort). 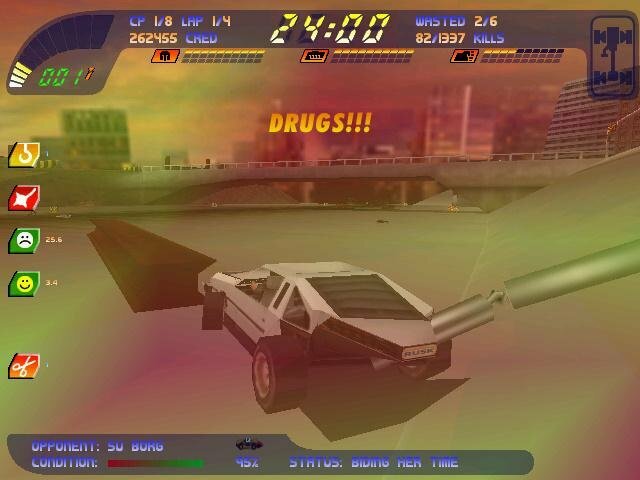 The game still uses the same structure as the original, offering multiple tracks per environment with each somehow managing to feel unique. 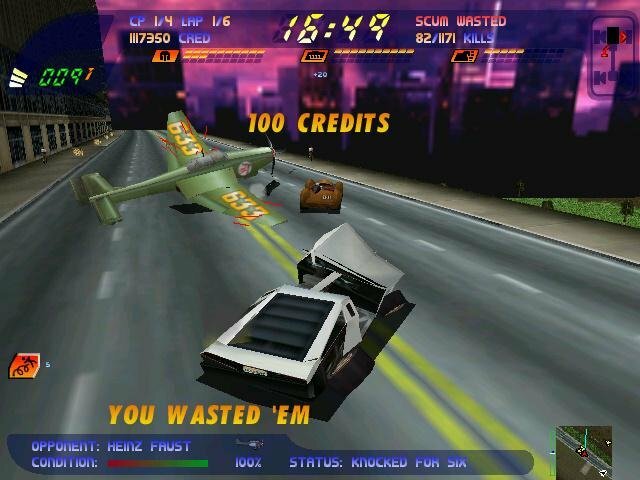 New to the sequel are goal-specific missions that range from destroying radar towers to killing psychotic escaped inmates (don’t ask). 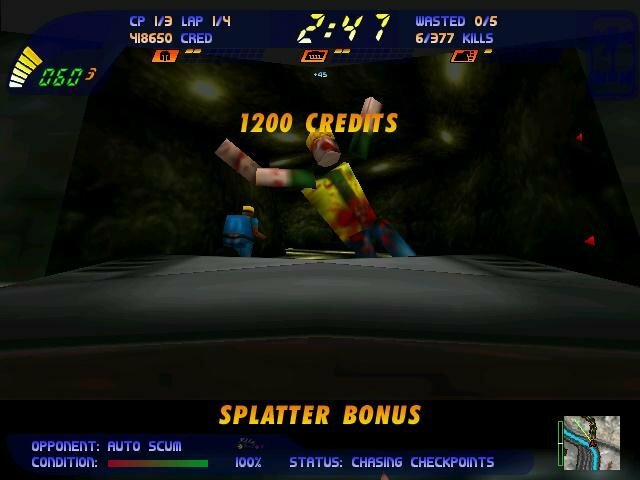 Most refreshing are the oddball power-ups, some new and some old, changing everything from gravity to your car suspension, and making for some pretty insane gameplay. As good as the carnage may be, Carmageddon 2 has the same problem as its prequel, and it’s one that’s shared with almost every racing game on the market. It all gets a bit pointless and repetitive without some sort of interesting wrapper. 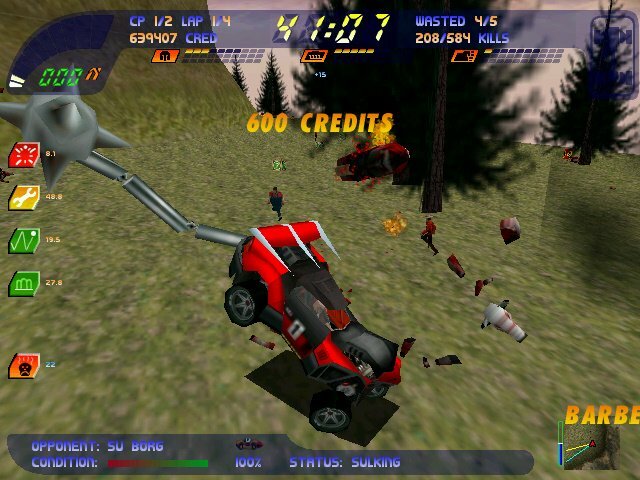 The missions were obviously an attempt at adding some variety to the game, but they fail miserably at that, and are just an obstacle standing in way of the carnage. But even that starts to wear thin after awhile. 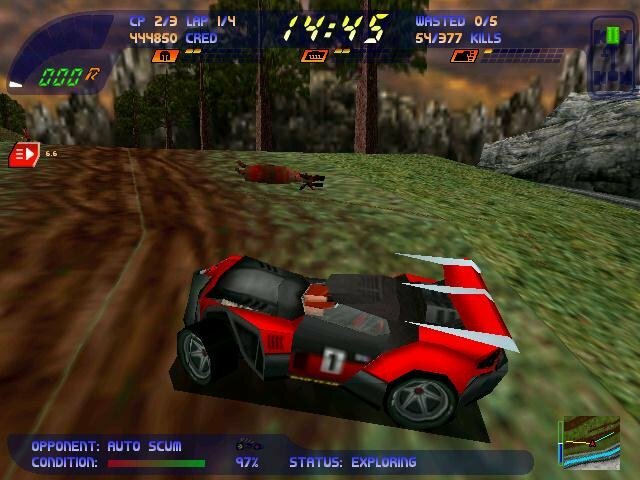 After more than 30 races of eviscerating pedestrians and ramming your opponents, it might be nice to have more clever missions objectives, or something beyond the usual “upgrade armor/engine” rut every racing game is stuck in. 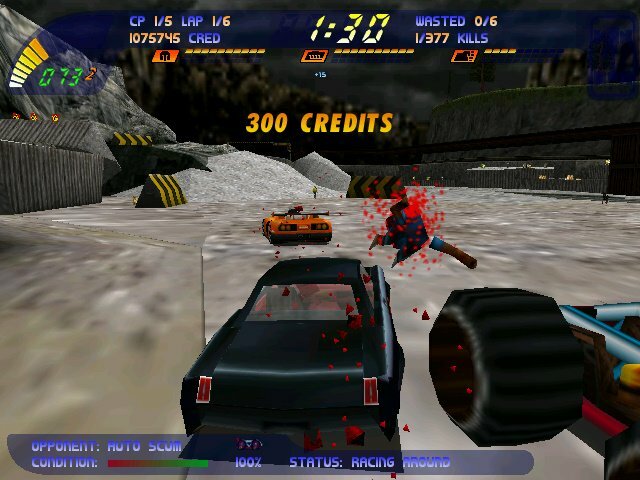 Carmageddon 2 retains its predecessor’s title as the sickest experience in gaming, one that’s so over-the-top and twisted that it ultimately proves cathartic for those who experience it. 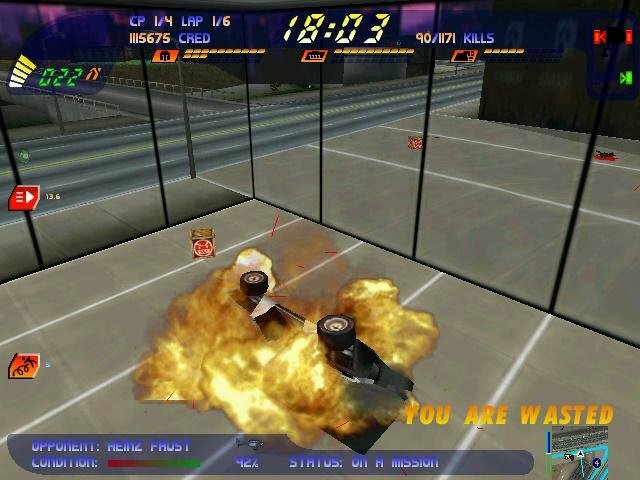 Though it’s probably a sign of severe psychological dysfunction, the game is so skillfully produced that you can’t help but laugh uncontrollably while playing. 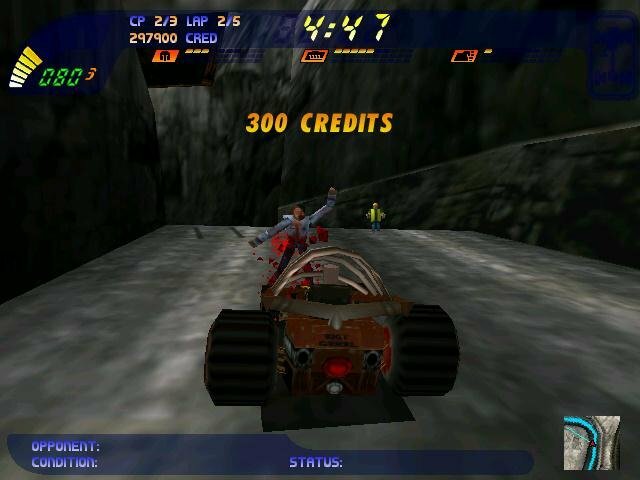 The mission-based levels are the greatest downer here, and they highlight just how terribly the game plays when you’re actually charged with racing through the tracks. 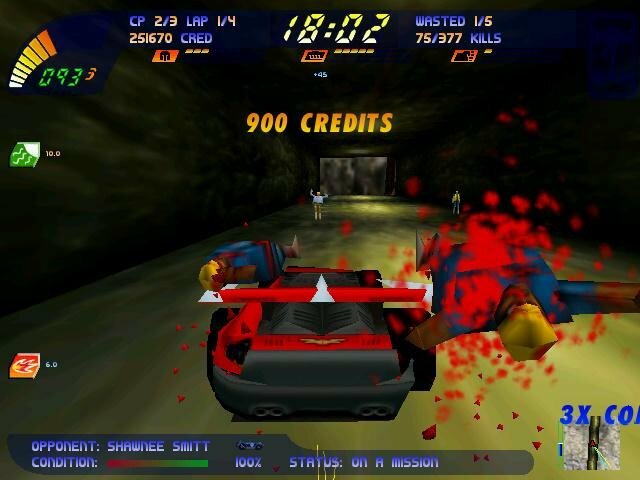 But when it’s pure and unaltered mayhem then this game shines.